Since I now have a clean, mostly organized kitchen, I’m ready to start digging in to all of the fantastic stuff that’s been sitting in my freezer for way too long. But because, before tonight, I hadn’t had a chance to do any pre-planning of meals, I didn’t have anything ready to go (or already going) when I got home from work. Fortunately, I ate a late lunch after meeting with my personal trainer (to set up my training sessions for the rest of the month! ), so I wasn’t really hungry when I got home. Which gave me time to defrost and marinate the pork. So, here’s what I did. In the plastic bag, combine oil, lemon juice, oregano, and garlic. Seal bag and “squish” marinade ingredients together to mix. Add pork chop. Remove as much air as possible and seal bag. Massage bag so that all surfaces of meat are covered evenly. Marinate for at least one hour, turning over halfway through marinating time. Preheat grill or skillet (medium-high heat). Cook 5 to 7 minutes, depending on thickness and how done you want your meat (I’m a fan of “medium” with pork). When meat is cooked to the desired doneness, remove from heat and season to taste with salt and pepper. The entire recipe for the marinade contains 3 net carbs. But because most of the marinade doesn’t stay on the meat, you’re probably safe to count only 1 carb for the finished product. Suggested side: asparagus sauteed with olive oil, butter, garlic, and finished with a splash of lemon juice. 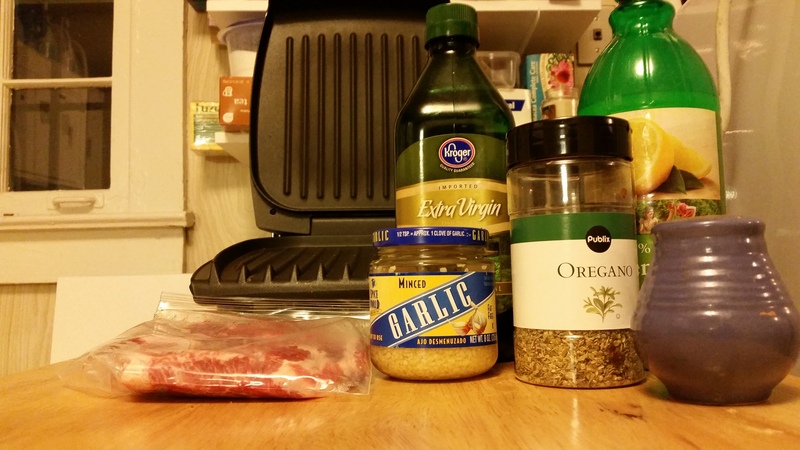 This marinade would work really well for lamb, as well. It was really yummy on the pork. I think it would be interesting to replace the olive oil in the marinade with yogurt, and give it even more of a Greek flavor. 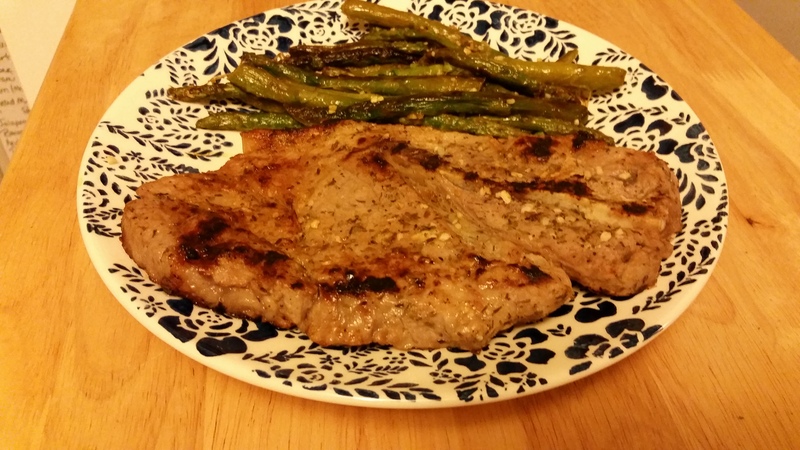 This entry was posted in Low-Carb, Recipes and tagged Low-Carb. Bookmark the permalink. Sounds good! I do have a pork chop on the menu for next week and I think this is it! I also like that it is for one serving. I spend a lot of time cutting recipes down as low as I can! It annoys me to always have to cut recipes in half (or fourths!) in order to make just one or two servings (two, if I’m planning it for a leftovers meal later in the week as well). So since I’m doing the math for myself to be able to fix these things anyway, I’m going to post the single-serving recipes I went to all the trouble to calculate! I have a cookbook at home that’s supposed to be meals for one or something like that but most of them actually make about two servings and they’re rarely low-carb.